We’ve been selected by one of the most data-rich departments in the UK Government for its landmark digital transformation programme. With hundreds of terabytes of information stored across multiple data centres, it will transition from long-term legacy systems to a next-generation Cloud strategy. Using AI.DATALIFT, we will analyse 250tb of unstructured data to understand its value, and then remediate and transition it to Microsoft Office 365 and Microsoft Azure. The digital transformation will unify multiple departments’ data allowing for actionable insights across the Group. 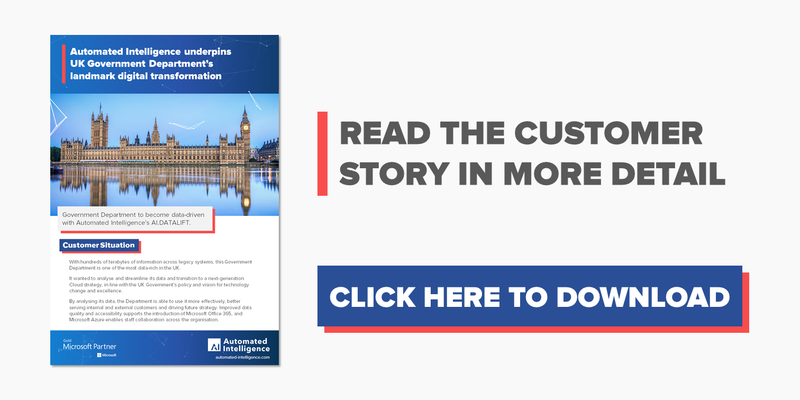 Simon Cole, CTO of Automated Intelligence said, “The Government Department’s ICT services will cost less to run and maintain, resulting in substantial cost savings that would have been incurred through an outsource contract extension. To read the complete case study on how we transformed this Government Department’s ICT services, please download it here.